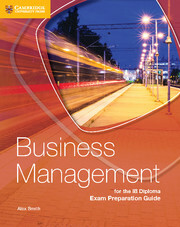 Designed for both class use and independent study, this Cambridge Elevate edition of Business Management for the IB Diploma covers the assessment objectives of the IB Business Management syllabus. It includes learning objectives and summaries, integrated Theory of Knowledge material, clear IB syllabus structure, accessible English for students whose first language is not English, exam-style practice questions and a chapter on exam techniques. Key Theory of Knowledge exercises built into the methodology, with questions and summaries aid knowledge consolidation. 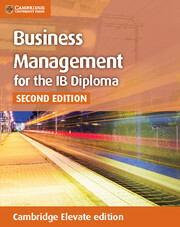 Divided into distinct sections, content follows the IB syllabus structure and specifications, making it easy to navigate. Written in clear and easy to follow English for students who are not native speakers. Essay writing and exam guidance help students prepare for the examination. 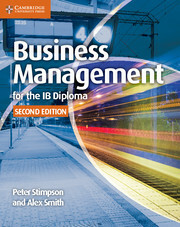 Co-written by practising IB Business Management teachers and reviewed by academic experts in the field ensuring a trustworthy resource. For information on how to use Cambridge Elevate enhanced editions and supported devices, please visit elevate.cambridge.org/support.